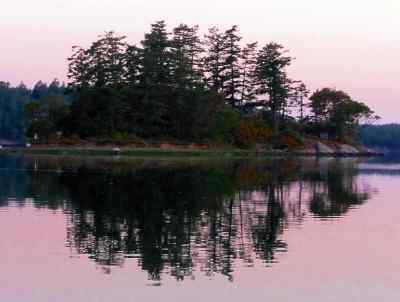 Information: - Spirit Island is a small, usually unnoticed island in Garrison Bay, offshore from the English Camp. Comments: - Here is the departure place for (perhaps) thousands of souls of the Native peoples who lived in this area for tens of thousands of years. - - When we cruise these waters, it's easy to forget that this area was home for thousands of years for a complex society. Here, in these islands, many were born, loved, fought, and died. - - The Salish who lived in the Northwest were composed of many groups who shared a common language but often had significant variations in their cultures. Consequently, there was no single group called Coast Salish. The many bands who spoke the shalishan language family were generally a peaceful people, whose economy was based on salmon fishing, supplemented by hunting and gathering. They lived through the winters in semi-permanent villages of sunken, earth-covered lodges, separating into small family hunting bands in the summer. The smaller bands used rough shelters of bark and reeds. Most Salish subgroups consisted of several independent bands led by a chief. Neighboring groups, whether villages or adjacent tribes, were related by marriage, feasting, ceremonies, and common or shared territory. Ties were especially strong within the same waterway or watershed. There existed no breaks throughout the south Coast Salish culture area and beyond. There existed no formal political institutions. The westernmost groups traded with the interior Indians and adopted many of the cultural traits of their trading partners. The western tribes along the coast often had a hierarchical society often consisting of nobles, commoners, and slaves. - - Salish religion was primarily shamanistic and animistic, and involved healing rituals and the belief in guardian spirits which were acquired by vision quests. The most important ritual was the guardian spirit dance held in winter. They were excellent carvers and today museums (and present-day artisans) display some wonderful artifacts that pass down to us the spirit of these peoples. 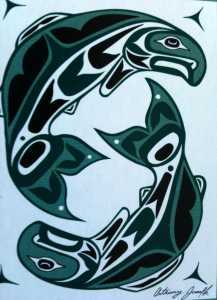 - - The Coast Salish did not carve totem poles, although we have met modern carvers of great skill in creating carving. The Salish were noted for their red cedar animal figure carvings. These were beautifully stylized and evoked deep feelings of awe and spirit. - - Grave sites were sometimes adorned with lifelike human figures as grave-markers, memorializing the spirits of those who had departed, although we observed none from offshore Spirit Island. - - The Salish were marvelous artists, and sometimes their work is wonderfully represented with small figures. A spindle-whorl, the disc that acted as a flywheel on the spinning device used for making wool yarn, was often used for small carvings and 'sticks.' Many everyday items were carved or painted. Even small cooking implements were often beautifully adorned with designs and motifs. 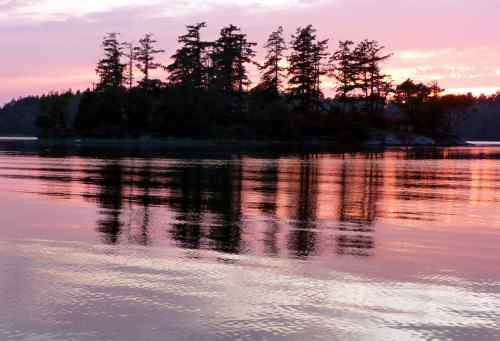 - - However, many believe the craftsmanship of the Coast Salish was best represented by their canoes, hewn and carved from a single log. These canoes were an economic necessity for the people, like a railroad or a highway, and also provided recreation in races. 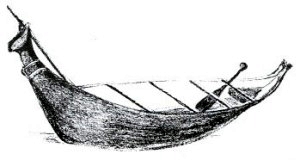 - - Canoes were also important for the burial of ancestors, and perhaps were used on Spirit Island. The canoe may have been elevated on poles, tied in trees, or perhaps placed on the beach. After the person or persons (sometimes relations were included at a later time) were placed in the canoe, a smaller canoe was often placed over the top as a lid or it may have been covered with mats. A burial was sometimes on a sand bar with the body placed under an overturned canoe either wrapped in mats or placed within a bent wood box. 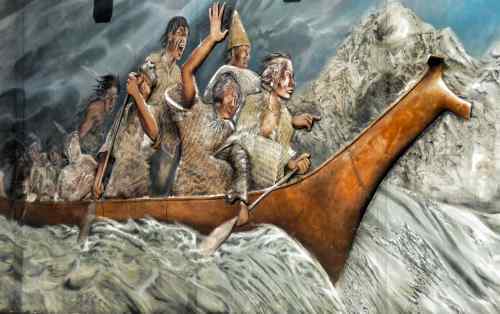 - - The family transportation canoes of the coast were from 16 feet to 35 feet, and could hold a dozen people. Almost every family and often every individual had a canoe, usually personally built. - - The larger tribal canoes were built by specialists in canoe building. These canoes, often highly decorated with painted carvings, were used in ceremonies or when visiting other tribal groups. Some canoes were built for racing, a sport relished by the Salish people. - - Before creating a tribal canoe, the carver would often have a vision quest to locate the proper tree and to 'see' the appearance of the canoe. During his quest, he might create a song to help guide him to the proper tree and to awaken a guarding spirit for the canoe. The most common dream spirit was usually in the form of a Pileated Woodpecker. The canoe carver, searching the forest, would listen for the chop-chop sound of the supernatural assistant working on his canoe. - - This woodpecker, larger than a Crow, is also a totem bird for El and I, since it 'launched' us on our hike of the Appalachian Trail and was a guiding spirit many times on our 2,000-mile journey. His laughing call would often encourage us up a steep climb. One time after a particularly hard mountain, El stretched out on the ground, exhausted, and a Pileated Woodpecker (usually a shy bird, more often heard than seen) landed on a thin limb a few feet above her. He walked the limb, turning and looking at El from side to side, 'chuckling' at her. 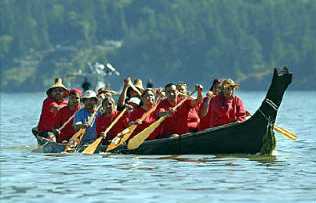 - - Today, the descendants continue to race or cruise with carved canoes. Every years this is a big event in the Pacific Northwest and thousands participate and watch the spectacle. 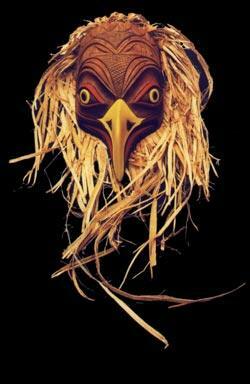 - - The stories told by the Salish people are engaging. Oh, if this island could only talk, think of the tales it could tell. Perhaps, this tale of the origin of The People, would be one of them. It was related by Snuqualmi (original spelling) Charlie to Arthur Ballard and is contained in the book Mythology of Southern Puget Sound. This version has been adapted by Tom Dailey and us. It is a long tale (but we enjoyed the reading and thought you would also). 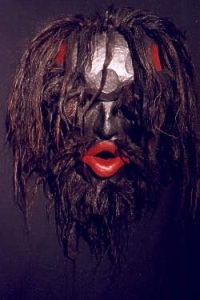 We have interspersed a few pictures of especially beautiful masks (we think), to beautify the tale. - - "In the Old Days all the people, the animals, plants, rocks and trees and rivers, supernatural beings, even the weather -- everything! -- was alive and could think and act much as human beings do today. But they also all had personal powers that we cannot imagine, like the ability to move quickly from place to place. That was in the Old Days. This is the story of how all of that came to change, how the world came to be as the First People knew it when they lived here on this land for hundreds and hundreds and hundreds and hundreds of years, before the settlers ever arrived. And then, of course, it all changed again but thats not part of this story. - - This story begins at the ancient village of TOHLTwh, which is just across the Tolt River from the little town we know today as Carnation. There were two young women, sisters, who lived there, about 15, 16 years-old. The older one was named tuhk-wee-YAY, the younger YAH-slibsh. Their parents were high-born, important people of the village. - - One day the two sisters went to dig fern roots, which were one of the main foods of their people. They went to dig on the prairie above a big dam, fishtrap or fish weir its called, that the people had built across the river. Today we know this place as Snoqualmie Falls. How it came to be changed from a fish weir into that huge waterfall we will find out later in this story. - - Now thats a long trip from the village to the prairie, about 10 miles, even if mostly by canoe and of course you couldnt paddle over the tall fish weir, youd have to park your canoe and walk from there. After a long day of digging it was so late the sisters decided to spend the night on the prairie and return home the next day. - - That night was clear and it must have been fairly warm and so the two sisters lay down to sleep. Looking up at the dark sky with all of those twinkling pinpoints of light, tuhk-wee-YAY saw one bright white shining star and she wished that it could be her husband. Another star nearby, one that had a reddish cast, she told her younger sister would be good enough for her to marry. Now, with these thoughts in their minds the two young women fell asleep. - - When they awoke in the morning each of them was lying by the side of a man who was her husband. tuhk-wee-YAY saw that her man, the one with the cloudy white eye, was old and wrinkled. On the other hand, YAH-slibshs husband, who had a reddish eye, was young and strong. - - Getting up, the sisters saw that they were in a strange country they had never seen before. It was perfectly calm, there was no wind at all. And as they would find out, it was always that way. (Or almost always.) In all other respects, though, the land about them was much the same as the land around their old village, TOHLTwh. And life went on there just as it did back home. During the day the men would take their bows and arrows and go out and hunt deer and the women would take their digging sticks and hunt for roots. The two sisters wanted to fit in with the customs of this place so they said to one another "Let us go out and dig fern roots, too." - - So they did. And they lived like this with their new husbands and their husbands people for day after day, month after month, through the summer and fall and into the winter. All this time the two young women did not know where they were. They missed their home, their family and friends, the familiar village of TOHLTwh, and all the land around it that they loved. And the older sister, especially, did not like her husband, even though he was good to her. She did not like to look on his wrinkled face and his pale, white eye. - - One day it happened that this older sister, tuhk-wee-YAY, found that she was going to have a baby by her husband, the old man. YAH-slibsh was sad when her sister told her this because her husband, though he was young, was always too busy to spend time with her. To hide her tears from this sadness, YAH-slibsh began to sit where the smoke from the cooking fire would blow into her face so the people would think she was crying from the soot in her eyes and not from her grief. - - The baby was born and was shown to be a healthy boy, but still both sisters remained unhappy, though for different reasons. While the child was very young they stayed home to care for him. But as he grew older they both again began to go out digging for fern roots. This time, though, the old man, tuhk-wee-YAYs husband, took the two sisters aside and told them that they should be careful not to dig the roots that went straight down deep, to dig only those that spread out and remained near the surface. - - For a time they followed the old mans advice, but they were so curious what would happen if they dug up the deep roots that one day they did. They dug and dug and dug, until finally with a blast of air, a strong wind came rushing up through the hole they had made. They had dug all the way through the bottom of the sky and now they looked down to their long-ago home on the earth so far below them. Now they knew where they had been all of this time. They had been living with the Star People way up high in the Sky Country. - - Because they were homesick and unhappy with their husbands YAH-slibsh and tuhk-wee-YAY decided to escape from their life with the Star People. They covered the hole they had dug and told no one about it. They continued to go out on their errand, but they only brought home a few of the fern roots. Every day now, they would do the same, taking the baby boy with them. - - Finally their husbands became suspicious and asked the sisters, "Before, your basket would always be full of fern roots, now why do you only bring home so few." tuhk-wee-YAY answered, "The baby cries and I have to dig alone while my sister cares for him." But that was not the true reason. Instead of gathering roots, the sisters had been gathering cedar branches and tearing the inside bark into long strips. They had been twisting the strips into rope and finally they had made a long rope ladder. - - On the fourteenth day after they had first dug the hole and caused the wind to blow, after they had first seen their home on the earth so far below them, the sisters went out in the morning as usual, taking the baby boy with them. This time they uncovered the hole. They hung the rope ladder down from the sky and found that it reached to the earth. YAH-slibsh stepped through the hole and onto the ladder. tuhk-wee-YAY handed the baby to her sister and began to climb down the ladder herself. As soon as she was through, she closed the hole in the sky and caused a forest to grow above it. This way their husbands would not be able to find where they had gone. - - Now the two sisters had been away from their home on the earth for a long time. Their grieving parents had asked the various Bird People, who were the best doctors, to search for their missing children. Blue Jay and the others had sung and danced, trying with their spirit power to find tuhk-wee-YAY and YAH-slibsh, but none could find them because their spirit helpers were not strong enough. Most of the doctors had given up the task and gone home, but a few were left, dancing and singing on the prairie, when the two sisters and the baby boy reached the ground. - - News spread quickly of their arrival and people gathered at the site where the rope was touching the ground. soo-WAHB-koh, the young womens father, asked that everyone celebrate the return of his daughters and enjoy themselves by swinging on the long ladder that they had made. From DAHK-shdibsh to KEHLBTS, a half-days journey by foot, the people swung through the air on the rope ladder. DAHK-shdibsh means footprint and you can still see what look like big footprints on the side of the mountain that the white people today call Rattlesnake Ridge. KEHLBTS is camping place, named for an old chief of the people. Today we call this Mount Si. So they all swung through the air clear across the valley where the town of North Bend is today. - - While the sisters were still enjoying themselves with the people who were swinging, their blind old grandmother tseh-LOH-yah, which means Toad, was caring for the baby boy. She had wrapped the fretful child onto a cradle board and was singing to him. After a time the babys crying stopped and he became very quiet, so quiet that tseh-LOH-yah got worried. She felt him and she sang out, "This feels like rotten wood [which, you know, can feel soft and yielding] instead of a baby." tuhk-wee-YAY heard her and came running over and found that, indeed, someone had stolen her child and replaced him with a piece of rotten wood about the same size. 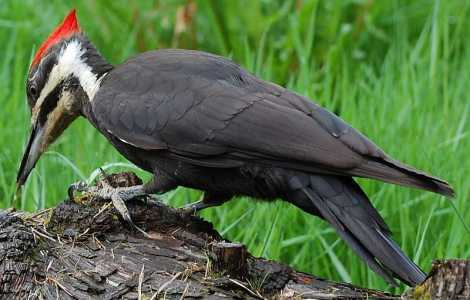 - - In her grief tuhk-wee-YAY took the babys cedar bark diaper and clutched it to her breast. Crying out her sorrow, she carried the diaper to a nearby stream, dipped it into the water and then wrung it out. Five times she did this. On the fifth time she heard the cry of a baby. It was a big sturdy child, a boy, who appeared there in place of the diaper. He had come to comfort the mother, her sister, and all of the people for their sorrow in losing the other. This is the one they named spee-TSEEkw which means diaper child. - - Now, all of the best doctors, the Bird People, were gathered again, this time to find where tuhk-wee-YAYs baby had been taken. Yellowhammer was the first bird to go in search of the child. He followed the trail to a narrow place where the earth was going apart and then coming back together. He tried to go through the opening but he was not quick enough. Woodpecker, KEHT-kehts, went next. Then Raven, SKWAHKw, followed by Osprey. None of them could get past the open-and-shut place. Finally it was the turn of Blue Jay, who was called SKAI-kai. - - When Blue Jay got to the passage he flew quickly up and down and almost got through without being touched, but at the end the earth closed against his head and made it flat. But Blue Jay was quicker. He did make it, and once through, he sang out for gladness at his success and his escape, "Kai kai kai". Then he looked around him and saw that he was in the land of the Dog Salmon People. They were the ones who had stolen tuhk-wee-YAYs baby boy. - - Blue Jay flew all over that place and found that the baby was now grown into a young man who was named Moon. Moon had married into the Dog Salmon People and now had two children of his own, two boys. When Blue Jay passed over him, Moon was making flint arrowheads. He picked up some of the flakes and threw them at that birds eye, saying, "Why are you flying around me like that? ", and then after a moment Moon said, "I do not feel right. I am feeling sad all the time." - - Blue Jay had been blinded by the flakes that Moon had thrown so he came down and spoke to the young man, saying, "Grandchild, I have come for you." When he heard this Moon cleaned out the birds eyes and Blue Jay told Moon who his mother was, how he had been stolen, and how all of his people were sorrowing for him and wanted him to return home. Moon replied, "I shall go, but not with you, Blue Jay, and not now." - - That young man, Moon, had needed more time to say good-bye to his own children. Only when he had done that did he begin his return home. Driving the dog salmon ahead of him up the river, Moon called out to them, "Dog Salmon, the new generation is coming now and you shall be food for the people." That is how Moon began his work of transformation. All the long way home to his mothers people Moon traveled, changing everything upon the earth. - - At first, the different Animal People that he came to, Moon changed easily into animals that could be food, birds and ducks and clams, and later land-otter and beaver. After a while though, the other Animal People heard what Moon was doing. They became afraid, and made weapons to defend themselves against this Transformer of whom they had heard so much but had never seen. - - That is how it happened that Moon came upon Deer making spear points of bone and singing, "With these I will kill the Transformer." Moon suddenly appeared in front of Deer. "Let me see those spear points," Moon said. Not knowing who this person was, Deer gave them to Moon who placed them on Deers wrists and saying, "You shall be something good to eat," Moon turned him into the deer we know today that still has those tiny bones near its ankle, so sharp you have to be careful or they will cut you. - - Next Moon came to a place where four women were fighting. Moon asked them what they were doing. One of the women said, "We are practicing so we will be prepared to fight Moon when he comes." Hearing this, Moon threw each of the women into the mud, saying, "You shall grow and be something good to eat." The women became what they are today, skunk cabbage, maidenhair fern, wild artichoke and sand rush. - - Moon continued his trip home. He tamed Fire which otherwise would have burned forever and destroyed the world. Sticks and stones, which used to be alive, he changed so that now they dont strike us whenever they please. He came across an old man who made fun of him, who mocked him by repeating everything that Moon said. This made Moon angry and the angrier he became, the angrier this old man became as well, turning Moons words back to him. On and on it went until Moon got the best of the old man, transformed him into echo. - - Finally it was that Moon arrived near the spot where he had been stolen as a child. There was a fish trap near there made of branches that stretched all the way across the river. Moon turned this fish weir into the high waterfall that today we call Snoqualmie Falls, so high that now no salmon can swim up to the land above it. - - After making the falls, Moon passed onto the prairie and there he was reunited with his mother and all of his earthly relatives. He met his brother, Diaper Child, who was now known as Sun. The people began celebrating and in their excitement they began to swing again on the rope ladder. Moon said to them, "The ladder will be there forever to swing on, or even for you to go up to the sky." - - Now it was time to make the light for the people to see by day and by night. Sun said to Moon, who was the eldest, "You travel in the daytime." So Moon began his journey through the sky. But as soon as he arose everything became hot. Water boiled in the river, fires began everywhere. - - "It is too hot," the people cried. So Moon came down and then he said to his brother, "I think it will satisfy the people better if you travel in the daytime." Sun did that and everyone was pleased. Now it was Moons turn. "I guess I am to go at night," he said, "Ill warm my back where the land has become heated by Sun." So Moon turned with his back towards the earth and the light from him was just right. Moons grandmother, Toad, was so happy to see him she decided to keep him company. You can still see her there on the Moon today. - - At this time the rope ladder on which the people had been playing fell to the ground. All eyes turned to see what had happened. It had been gnawed in two by Rat. Ahh. Everyone was angry and sad. Moon made a curse on Rat. He said, "From this day, Rat, you will gnaw and steal whatever people want and destroy what is good. You will crawl on the earth and everyone will curse you." - - Now it was about time for Moon to go up into the sky, but before he went he did three more things. The people of that time who were sitting around he turned into the rocks of the mountains. He made all of the rivers we know today. And as he made them, he named them - the Snoqualmie, Puyallup, Nisqually and Duwamish he made. He made the Snohomish, Skykomish, Stillaguamish and Skagit. - - And then a man and a woman he placed on each river. - - Moon said, "Fish shall run up these rivers - salmon. They shall belong to each of the people on its own river. They will each make their own living from the fish, the deer and all the other wild animals I have changed." - - From these first couples the people increased in number until many people lived on these rivers. 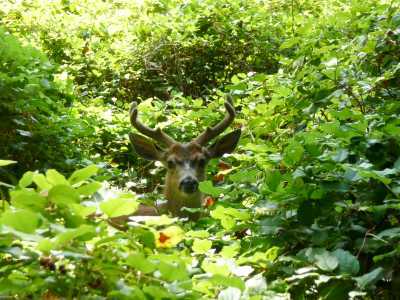 They have lived here for hundreds and hundreds and hundreds and hundreds, and hundreds of years, on all of the land between the mountains and the water of Puget Sound. For all of that time, until the settlers came, there was food and shelter for all of the people. And it was all the work of Moon and of no one else but Moon." 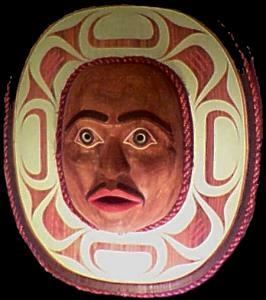 In Nuu-chah-nulth mythology the Earthquake mask is named Tagit, an ancestor who lives on the mountainside. He caused tremors or major earthquakes when he felt nature had been disturbed or abused by humankind. He did this to remind us how small we are and that we must all have respect for nature. The spiritual embodiment of everything in the forest. He is the wild man of the woods and chief of the ghosts. Bak'was lurked at the edge of the forest threatening and beckoning. He ate ghost food and tried to persuade humans to eat it as well to become like him. He was associated with spirits of people who had drowned and they hovered near him. 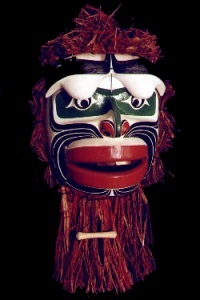 The Bak'was mask has a shadowy, human-like form, accentuating the attributes of a skull. His lips are often drawn back to give prominence to his teeth. His eyes are sunk deeply into their sockets, with a brow that juts forth and cheeks that are hollowed. 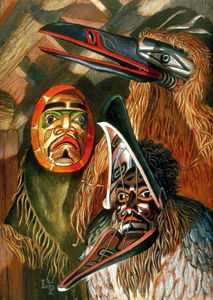 When the Bak'was mask is danced, the play of light from the flickering fire and wild movement casts ominous shadows across the mask.